The founder of the EDL, his camerawoman and another cameraman appear to be attacked by a group of men wearing balaclavas. Mr Robinson claims he was in the area to film a “left-wing conference”. 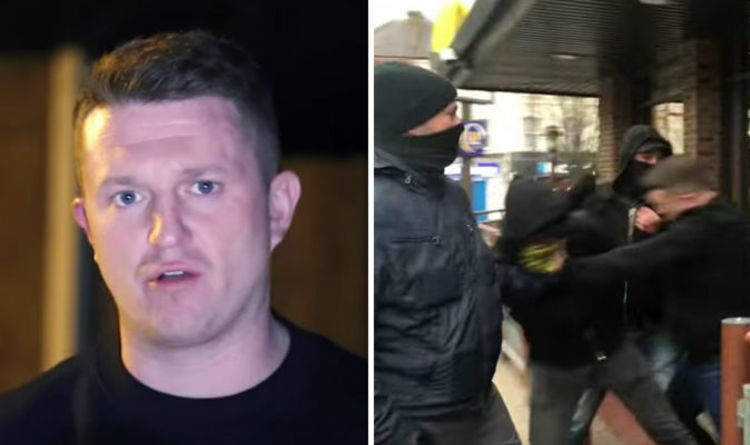 In the video posted to his YouTube page, he said he saw "six or seven men coming towards me" and "four of them went for me” and that he was "attacked by left-wing extremists". The footage also shows one seemingly attacking members of his camera crew. Mr Robinson can be heard asking if they want to go “one on one” before the brawl breaks out. When the former EDL leader begins to swing for the group, his feet are kicked from underneath him by one of the group and then he is punched and kicked on the floor. The incident happened on Saturday. It is not known who the group are or if there are any serious injuries. After the incident a bystander asks if Mr Robinson is OK and shakes his hand. Mr Robinson also complains that the police did not investigate the incident because they cannot identify the attackers. The far-right leader tweeted on Saturday: "I’ve done more scrapping as a journalist than I did going football." He added: "Camera woman (Lucy Brown) thrown on the floor and kicked in the head. Cameraman attacked. Microphones & cameras smashed. Police everywhere." A Metropolitan Police spokesman said: “Police were called at approximately 15:45hrs on Saturday, 10 March to reports of a disturbance on Green Lanes, N15. "Officers attended and spoke with a 35-year-old man who alleged that he had been the victim of an assault. "He did not require hospital treatment. There have been no arrests and enquiries continue." Also, a few months ago footage was released of Mr Robinson punching someone at the Royal Ascot. Mr Robinson is no longer involved with the EDL and spends his time as an activist.